VietNamNet Bridge - The creator of the ‘waste-to-electricity and organic carbon technology specifically designed for Vietnam’ is Nguyen Gia Long, director of the Hydraulic Machines Company (HMC). PM Nguyen Xuan Phuc recognized his technique as a ‘creative work of Vietnamese intelligence’. The technology invented by Long has a special significance because it is believed to be the best suited to waste treatment technology for the country. 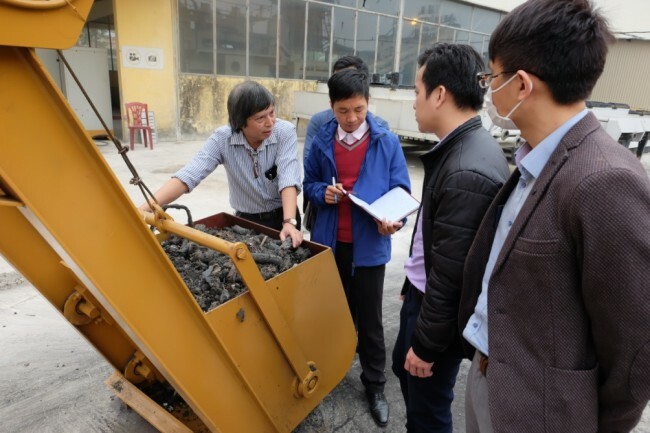 It can solve the question that European advanced waste treatment technologies did not – converting waste into electricity and organic carbon in the specific conditions of Vietnam where waste is not sorted at source. This is multi-fuel gasification technology. The input garbage is cut into small pieces on a conveyor belt and separated into two kinds of material. The first one is organic soft tissue and water, materials that easily decompose, producing odor and attracting insects. This material is mixed with carbon coal in the process of waste treatment, which creates the material Long calls 100 percent ‘organic carbon’. This material can be used to make fertilizer. The outstanding advantage of the technology is the reasonable treatment cost. As the technology and equipment are made in Vietnam, the solution is affordable. In addition, waste treatment plants will not have to spend a lot on labour because of the high automation level. The second kind of material consists of fiber residue. It is mixed with soil, sand, rocks, iron and plastic and dried to reduce the humidity level. After that, the dried material is pressed into bars and put into multi-fuel gasification furnace. Under the heating process, syngas is generated. The final product of the process is electricity and carbon coal to be mixed with organic soft tissue. According to Long, with the technology, the entire garbage mixture can be transformed into useful products. After the treatment process, there will be no waste water that needs further treatment, no emissions, and no solid waste that needs to be buried. It is not an open combustion system, so it will not create secondary emissions. Long said that the technology solution is easy to apply and could be used on a large scale in the community. The technology has been successfully tested. It fully treated 208 tons of unclassified solid waste provided by the Ha Nam Urban Environment Company, generating electricity for the entire lighting system in the Dong Van 2 Industrial Zone. The electricity generated from waste residue has been provided to the national grid in HCMC, while the organic carbon has been recognized as having nutrition level two times higher than the organic microbial fertilizer now available in the market.